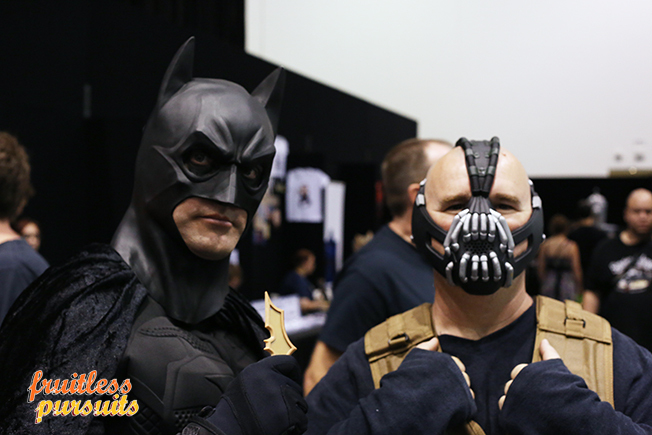 Fruitless Pursuits: Oz Comic Con Perth 2013: Day 1 Highlights! Waiting by the wall of windows we were treated to many unusual early morning sights including a baby commanding in a cardboard U.S.S. Enterprise, The Flash in a wheelchair, and a young man seriously and diligently combing a long silver wig. Perth today was definitely under the spell of some wonderful weirdness. 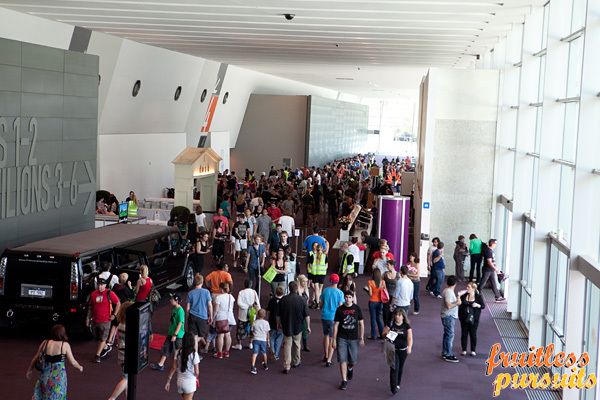 You may also note that in the above photo there is a stretch hummer, which actually has nothing to do with Comic Con, but belonged to the Bridal Exhibition next door. As you can probably imagine, this led to a very unlikely mix of attendees. Young, hopeful girls clutching bridal magazines were no doubt frequently jostled by papier mache swords and anime wigs. Once inside it was still packed all day, but there was more breathing space than the crowd outside would suggest. 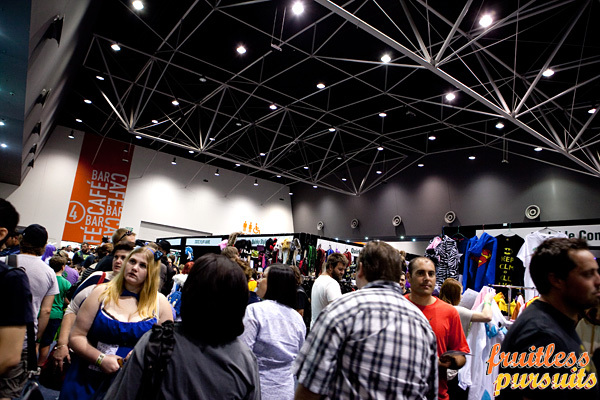 A decent amount of space between stalls and plenty of opportunities to photograph con-goers. 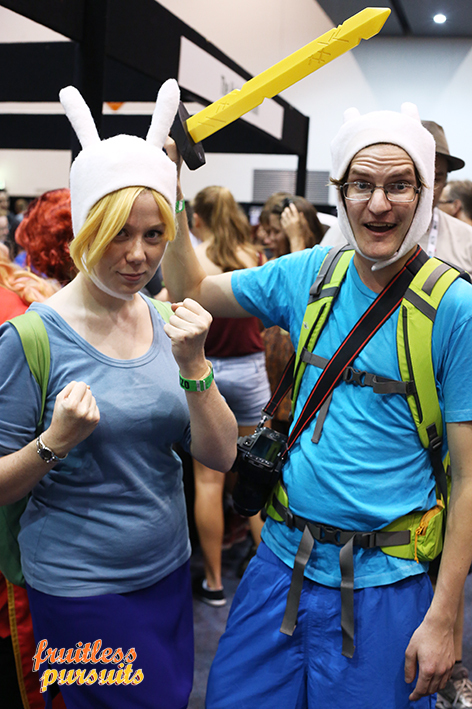 Adventure Time still proved to be a very popular costume for convention season. And always great to see Fionna out in force. I think she's quickly becoming a favourite. And today there was no shortage of wookiees. I think they may have been running security. Okay... that wookiee security guy looks like he's slacking. Hopefully we haven't gotten him into trouble. 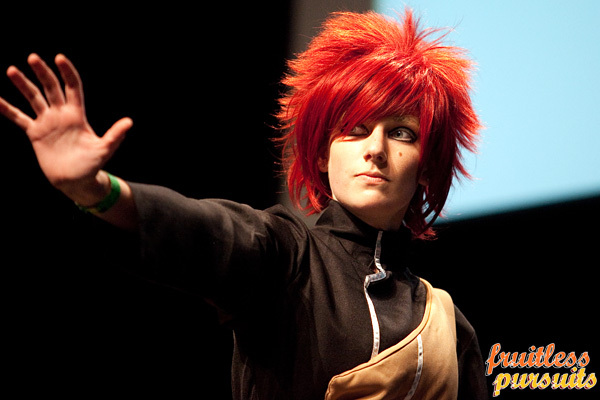 The cosplay culminated in a parade/competion in the stunning exhibition centre main auditorium. We'll do a proper post on that later, but here's a preview to get you wild and amped. Okay, so I'm old. 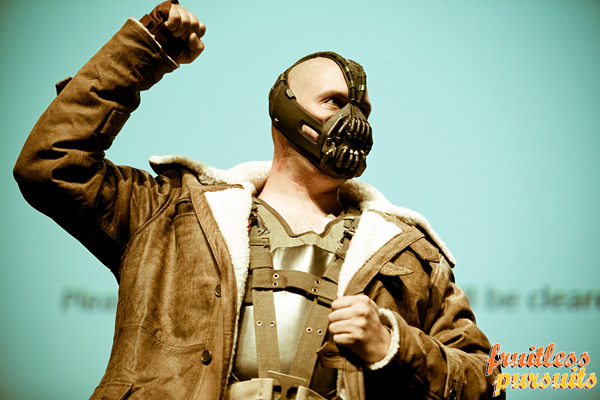 But I DO know who Bane is, and this Bane came in and totally rocked the house. I thought he was going to start a revolution. As soon as he pumped his fist into the air I tore two strips off my shirt: one to tie around my forehead like a bandana, and one to stuff into a Molotov cocktail. All West Australians had to vote today. I hope you voted for Bane. 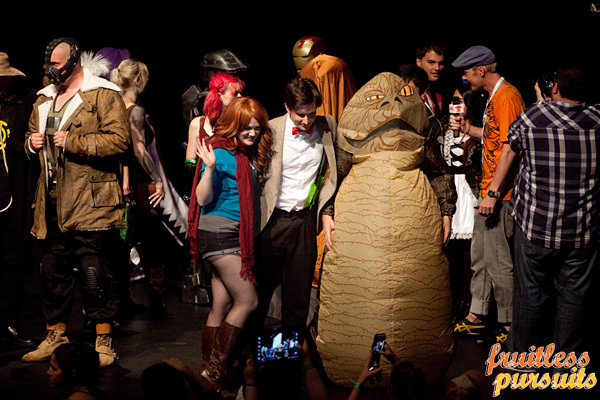 But it was that guy in the goofy store-bought inflatable Jabba costume that brought down the house. Everyone went absolutely nuts as he slowly wobbled across the stage. 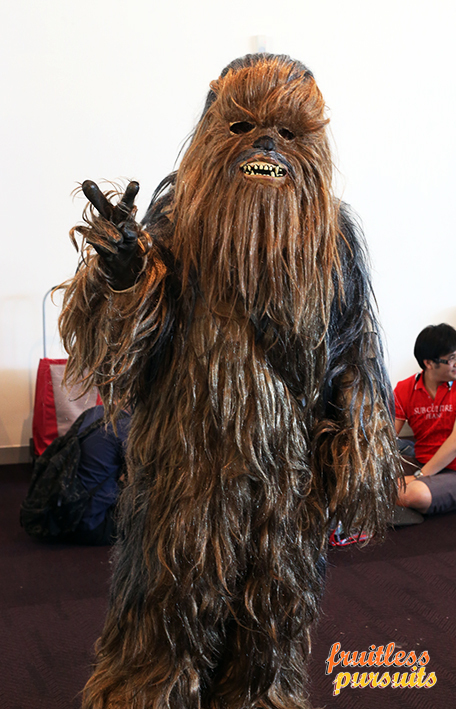 Hopefully Oz Comic Con will recognise this and get him signing autographs tomorrow. Speaking of autographs, most of us are yet to get any, but that will be tackled tomorrow. I would love William Shatner to sign my retro style Mirror Universe Kirk doll. Now all I need to do is watch that episode. We didn't meet him but we did get a glimpse of him. And it was glorious! And we saw the mighty Jason Momoa (Game of Thrones, Conan the Barbarian) roaming around in the wild and plunging attendees into darkness with his huge shadow. He made brief eye contact with Suzanne who later speculated on twitter that he may have made her pregnant. Momoa himself "favourited" the tweet which makes him a good guy in my book, so hopefully tomorrow he will teach us to speak Dothraki and induct us all into the clan. (Update: No - sadly it's just a confusingly named fan twitter account?) Oh well, he's already proven today that his handlers cannot tame him, repeatedly escaping into the wilds of the con floor to hunt and graze, so maybe we'll see him again. Speaking of the con floor, I want to make a couple of early recommendations for stalls. 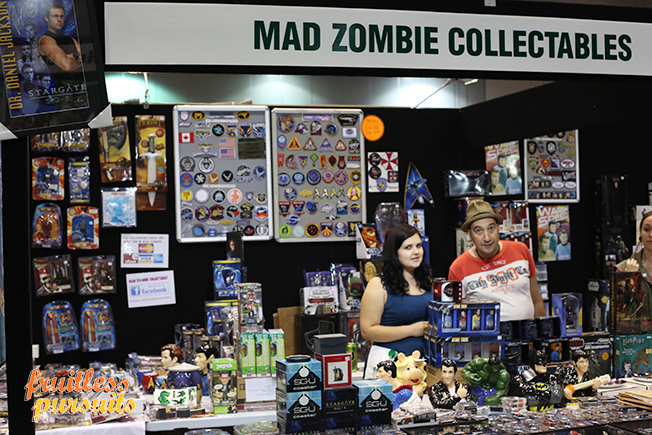 There was a lot of unique and unusual stuff at Mad Zombie Collectables who join us all the way from Adelaide. 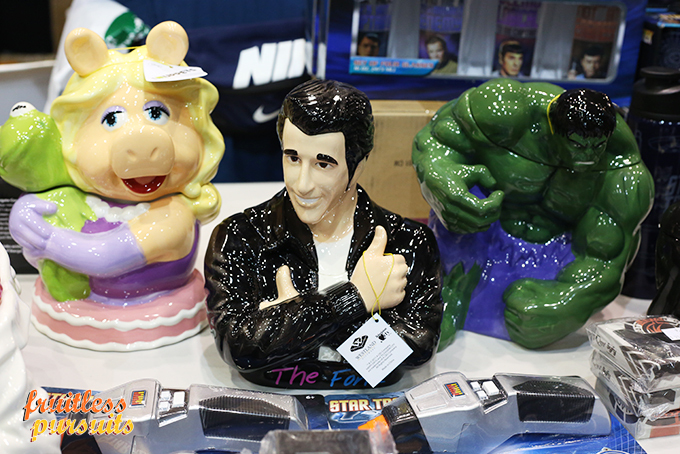 Sure, I don't know who those anime characters were, but I sure LOVE THE FONZ. Heeeeeeeeeeyyyyy. Stay cool. I wish my office was in a toilet. And the other very cool store was the hilariously named I'm Rick James Bricks for all your Lego needs. 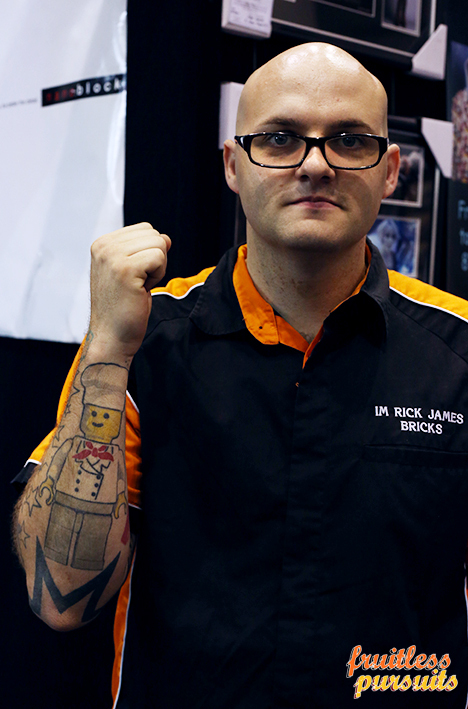 And if you think we love Lego, check out the dedicated proprietor's fantastic classic chef tattoo! IS THAT NOT THE BEST THING EVER!? 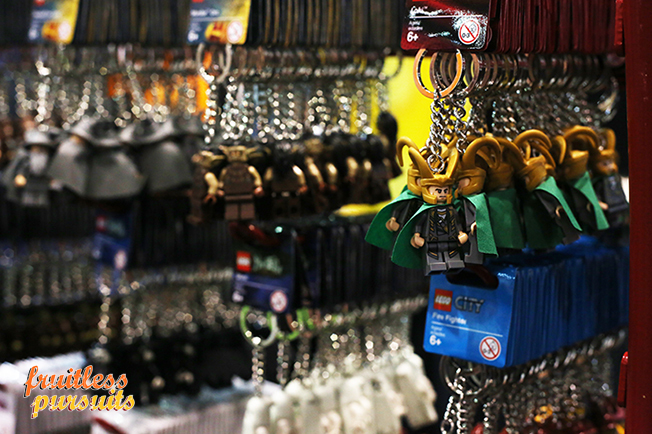 And I was totally seduced by all these keyrings... I picked up a Bossk, because who doesn't adore a space lizard. Also managed to fill in some gaps with my blind-packaged minifigs. He had a lot of open figures to choose from. If you're a Lego enthusiast then definitely check this one out! And that's all you get for now! That's your first taste. 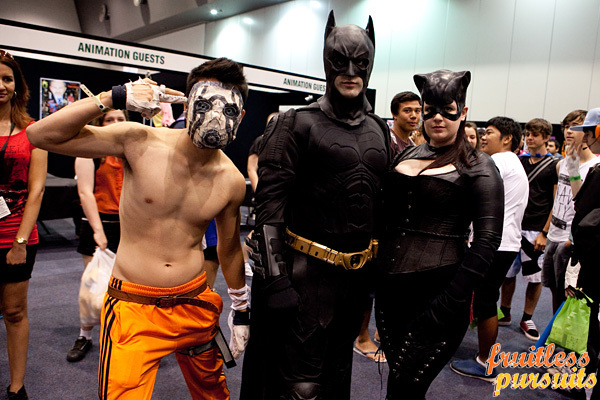 We're back tomorrow and there'll be more cosplay, reports on panels and guests, and hopefully - if we can wrangle it - a few surprises. Thanks, Comic Con! See you tomorrow! Great write-up. Looking forward to day two! Many more pictures coming in the next few days! That was about the most awesome thing I had ever seen. Parenting: You're doing it right! You made an awsum maid deadpool! lol. Thank YOU! 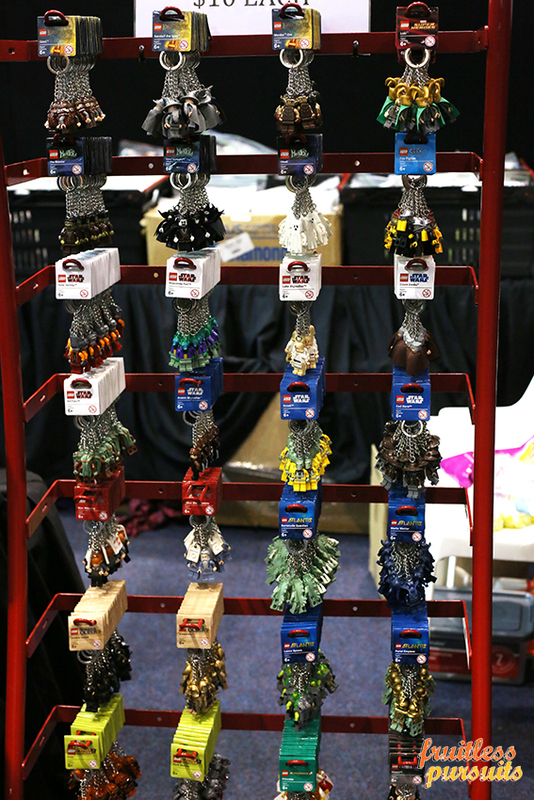 Will definitely be keeping an eye on your site, and will swing by when next in Adelaide! Great to meet you! 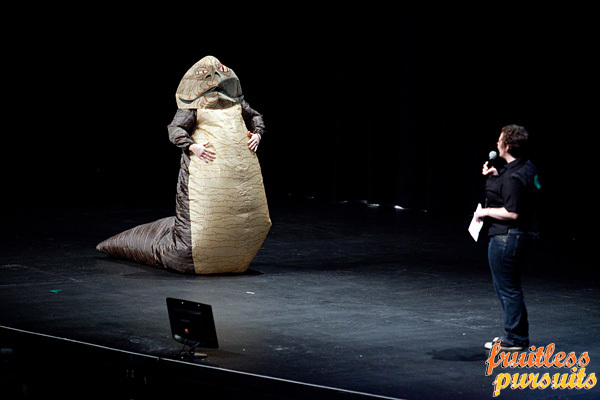 Jabba was female? Someone really HAS been reading my fan fiction! Nice photos. Love the commentary! We're feverishly working through all our photos as we speak, so hold tight! They will likely be up on our Facebook page a little earlier than here, so be sure to 'like' us! Great write up, I was/am Bender! I had a great time with everyone! 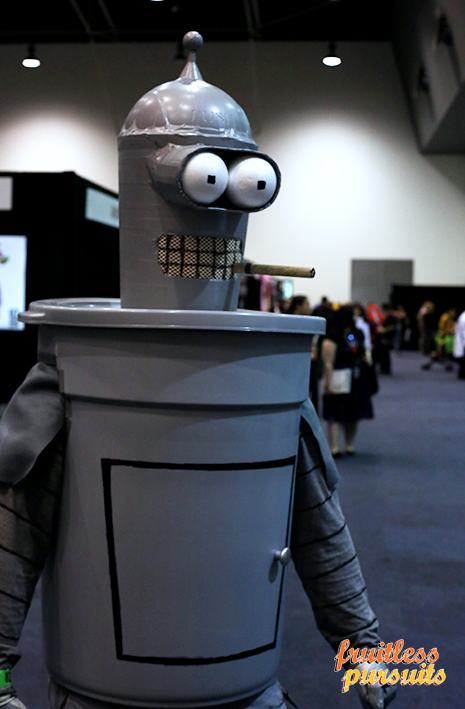 I am now actively looking for excuses to wear Bender in real life, any ideas? Bender needs no excuse! Wear it everywhere and go nuts! HAHA! Yes! Wear Bender everywhere! 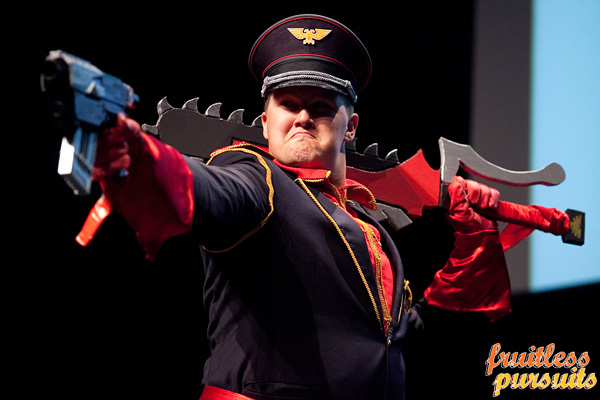 No excuses needed to be emormous cosplay nerds! lol. I am/was the young Doctor with french maid Deadpool. lol. I plan to wear the trench coat around whenever the weather is cold enuf! lol. (Cos I take every chance I get to be random and dress in costume in real life too!) lol. I once went camping dressed as Captain Jack Harkness... I actually own a genuine WWII great coat! lol. For the exceptional Outdoor Blinds, there is no better option than Modern Shade Solution. That allows me penetration from the sun, wind and rain. Now I am utilizing my outdoor space.